Relax after a long day in this traditional sofa. 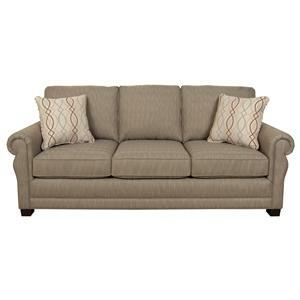 This piece features padded panel rolled arms and reversible Comfor-Gel seats for extra comfort. Pair the sofa with the complementing press back recliner and you'll be well on the way to your dream living room! The Sinclar Traditional Sofa with Rolled Arms by Jackson Furniture at EFO Furniture Outlet in the Dunmore, Scranton, Wilkes-Barre, NEPA, Bloomsburg, Pennsylvania area. Product availability may vary. Contact us for the most current availability on this product. The Sinclar collection is a great option if you are looking for Traditional furniture in the Dunmore, Scranton, Wilkes-Barre, NEPA, Bloomsburg, Pennsylvania area. Browse other items in the Sinclar collection from EFO Furniture Outlet in the Dunmore, Scranton, Wilkes-Barre, NEPA, Bloomsburg, Pennsylvania area.